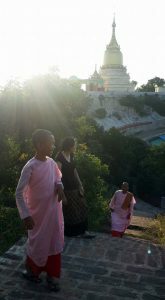 From September 2015 to April 2016 I had the opportunity to stay in Sagaing, Myanmar at a Buddhist nunnery. Sagaing, which is near Mandalay in central Myanmar, is a major monastic center. As my research involves Buddhist nuns and their training, I was able to conduct preliminary research, figuring out future sites of interest and which research participants would help me. This wasn’t my first trip to Myanmar but it was the longest. Having received the University’s Less Commonly Taught Languages Grant, I was able to work on my Burmese language skills and focus on reading texts, traveling 2-3 times a week to nearby Mandalay and learn with a private tutor. As the nuns with whom I was staying with couldn’t speak English, I had to use whatever Burmese I knew, which helped cement what I was learning. I also worked on part of Professor Emmrich’s project, Once the Buddha was a Girl, regarding nadwin (nā” thvaṅ’”) or ear boring. I traveled to Mandalay and a couple of remote villages with Research Assistants Ma Swe Swe Thet Htoo and Ma Thet Linn Wai. There, we discussed with the locals their nadwin experiences as well as met with some astrologers in the Ponna community to understand more about these rituals and how they have had to adapt to the current conditions. Photos by Ma Swe Swe Thet Htoo. I had many memorable experiences but it was the simple things that became habitual that I miss most, such as taking walks with one of the nuns every evening to the river. There, we would pay respect to the Buddha statue and then I would play with the stray dogs at the river bank, making remarks about the different cruise boats that had docked. When I would return, sometimes I joined the nuns chanting Paṭṭhāna in my building. There was one child nun who I grew very attached to. When I was homesick or having a bad day, her joyful presence would lighten my mood. We would play, throwing a ball or balloon when the older nuns weren’t looking, and I would spoil her by bringing her stuffed animals. I helped her learn English and I would ask her to show me which Pali verses she was memorizing at the time. Overall, my time in Myanmar was lovely and fruitful and I can’t wait to return again very soon. Rachelle Saruya is a doctoral student in Buddhist Studies.